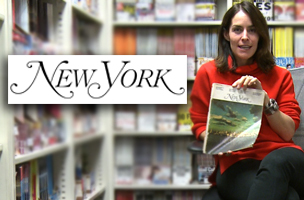 The folks at New York Magazine let MediabistroTV take a tour of their offices at 75 Varick. Nestled next to the entrance to the Holland Tunnel, the writers, artists, photographers and digital types inhabiting the sunlit space sit surrounded by the vigilant ghosts of covers past. The whole scene gives the impression Bernie Madoff in Joker makeup, Alex Rodriguez staring straight ahead and a suspicious looking Joaquin Phoenixare there to remind everyone to do something memorable, like watch this episode of Cubes.